The Ionian Sea is the ideal place for sailors, with its peaceful and clean water which makes it one of the safest regions for sailing in the world . Yachting holidays in Corfu and the other islands of the Ionian Sea are ideal for beginner, as well as fot experienced sailors, because of its geographic position, combining beauty of the landscape, many havens , mild climate and the existence of an international airport. The landscape is beautiful with numerous picturesque villages , numerous fortresses and fortifications from the Venetian times. Well-protected bays surrounded by ; pine and olive tree forests , busy cosmopolitan towns and endless beaches , where you can swim and eat at the local restaurants . Sailing will give you the freedom to go to places which are not accessible by land. No matter where your accommodation is, there is certainly a tourist agency which can suggest a few guided tours by bike or by coach, a car safari, a boat trip to interesting places of the island, as well as of the greater regionτης , like the Diapontian islands, Paxos (or Corfu, if you are staying at Paxos ) , Parga , the archaeological city of Vouthroto in Albania etc. Welcome to one of the wealthiest markets in Greece. The market of Corfu town reflects its history and the atmosphere which you will experience wil take you back to the trade of the 17th and 18th centuries in Corfu. These centuries, the port of Corfu was a meeting point for peoples and cultures . Ship travelling around the Mediterranean would stop here, at the first important port of the Serene Republic of Venice , and, naturally, people , ideas and merchandise from’ all over the world were introduced here and enriched the local culture . Corfiot identity still contains trace from this period : today on the island reside many "foreigners" whi have chosen to live here permanently , they have created their own businesses and they introduce to the island goods , at a unique variety for any other place of Greece. At the historic center of the town, workmen and artisans would manufacture and sell merchandise of unbelievable variety. Evraiki (the Jew area) , Pinia (another central point of the town) and generally the entire town would provide all kinds of shops . Today, both downtown and throughout the island, you will find stores and galleries that keep this tradition alive . Items and products of the nature of Corfu and its popular tradition will attract you with their elegance and original character . Hand-crafted jewelery, ceramics, woodcuts, wine, desserts, honey, olive-oil, green soap, kum-kuat are but a few of the products which you will find in abundance and reasonably priced . Thousands of people come to Corfu each year exclusively for cycling . Everyone consider Corfu to be the ideal place for their favorite hobby . Your bike can take you to places that you would have otherwise discovered only on foot, you can feel the place and the people there, you can feel the peace and quiet and discover desert beaches. Slow cycling through shadowy roads or the sensation of comfort along paths through rivers , are experiences which you shouldn't miss . Corfu has got a well-known golf course (18 holes ). It's got the infrastructure and comfort that a golf player will need, as well as a unique environment that will enchant you . Designed by the famous architect Donald Harradine at Ropas meadow, at the region Ermones , Corfu Golf Club is open from March till November and it is suitable both for beginner and for experienced players. The forst time that tennis was ever played in Greece was in Corfu at the late 1800s . Ever since then, Corfiots continue playing tennis to this day, as it has become a popular sport. 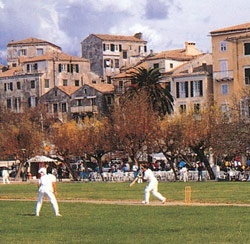 Besides the historic Tennis Club of Corfu , organized courts exist in several hotels on the island. It is also important to know that matches of the world championship take place on the island every summer. Few places offer so many possibilities for horse-riding as Corfu . The thich vegetation , the numerous desert paths and the habits left since the time that the English ruled the island, give riders today unique possibilities for enjoyable horse-riding. Regardless if you are beginner or experienced riders, the riding clubs of Corfu will provide you with the suitable horse and a special tutor who will show you around in places that you couldn't have visited without a good horse . The tradition of 170 years continues to this day at the only place in Greece where cricket has serious foundations. Five clubs and two fantastic pitches are there for you if you want to come here with your team or alone and have a great time practicing your favorite sport. Official tournaments and friendly, inofficial matches are organized all summer long at the most spectacular pitch in Europe: at the Spianada square in the historic center of Corfu, while the pitch at the Marina, Gouvia is more comfortable and has got better infrastructure . Corfu, Paxos, Othoni, Erikousa and Mathraki are the top destination for scuba-divers therefore ’ organized diving centers exist around the islands of Corfu and Paxos . Beaches and gulfs , capes and big reefs , consist the ideal place for younger and older divers . From June and all through the summer, the sea is warm and anyone can practice their favorite underwater activity . Regardless if you want to go fishing in order to ensure a bite for your friends or if you just want to take underwater pictures or even to spend several hours contemplating the sea with your mask and snorkel, the underwater world of the islands of Corfu is amazing .